Michigan policymakers must decide whether to expand the state’s Medicaid program to cover people newly eligible for federal Medicaid subsidies under the federal Affordable Care Act of 2010. Federal Medicaid funding would now extend to people earning up to 138 percent of the federal poverty level, even if they are adults without children. Under the proposed state Medicaid expansion, the number of potential new enrollees is high. In 2010-2011, approximately 1.2 million nonelderly people in Michigan had incomes of 138 percent or less of the federal poverty level and did not receive Medicaid. Of these 1.2 million, an estimated 647,700 were uninsured. Many of the low-income individuals in both groups would be eligible for Medicaid under an expansion. The size of the scheduled federal Medicaid subsidies for the newly eligible is also high. Congress is slated to pay 100 percent of the cost of these enrollees’ Medicaid coverage from 2014 through 2016, with the percentage slowly declining to 90 percent by 2020. The potential magnitude of these payments does not mean accepting them is the best policy, however. For example, consider one target population of the expansion: people who are uninsured and have incomes between 100 percent and 138 percent of the federal poverty level. The authors estimate that in 2014, approximately 177,000 uninsured Michiganders will fall into this category. Assuming that about 70 percent — around 124,000 — of these newly eligible sign up for Medicaid, the authors estimate that the additional cost during the following decade would be $475 million to state taxpayers and nearly $7 billion to federal taxpayers. These figures represent the costs for just one post-expansion population, but they are illustrative. The $475 million cost for state taxpayers over a decade is an estimated $144 million more expensive than it would be for the state to purchase 10 years of basic private insurance for these roughly 124,000 individuals on the federally subsidized state health exchange. Indeed, because the out-of-pocket cost of such basic exchange insurance is legally limited to just 3 percent of income or less for individuals in this income group, the insurance is a feasible alternative for these individuals without an added state subsidy. Notably, the partial enrollment projections above do not include three other significant groups of possible post-expansion enrollees: uninsured people who are already eligible for Medicaid but have not yet enrolled; low-income, privately insured individuals who would switch to Medicaid; and childless adults and others who live below the poverty line and would now qualify for Medicaid under the broader definitions of the expansion. Many of these individuals would apply for Medicaid, too. Supporters of the expansion have suggested it would produce 450,000 new Medicaid beneficiaries in Michigan.The Washington, D.C.-based Heritage Foundation projects that the net cost of the proposed expansion to Michigan taxpayers would be $1.3 billion through 2022. The state’s costs for post-expansion enrollees could rise quickly if Congress chooses to reduce the currently scheduled federal Medicaid subsidies of 90 percent and more. Costs are also likely to exceed estimates due to the difficulties of determining someone’s Medicaid eligibility under the Affordable Care Act. A Medicaid expansion would likely shift many insurance costs being borne by the private sector to state taxpayers. Studies have found that as many as 50 percent or 60 percent of new enrollees following Medicaid expansions actually dropped their existing private insurance in order to enroll. A conservative estimate is that 29 percent of new enrollees under a state Medicaid expansion would be people relinquishing their private insurance. A significant number of low-income Michiganders have private insurance. In 2010-2011, an estimated 512,000 Michigan residents with incomes of 138 percent or less of the federal poverty level were privately insured — about half of the 1.1 million Michiganders in this income group who were covered by Medicaid that year. 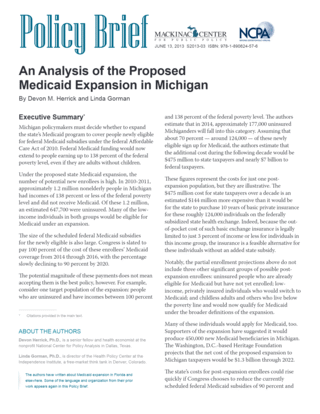 When a portion of these privately insured individuals drop their insurance for Medicaid, they will be switching to a program that generally provides much smaller reimbursements to health care providers — one reason a Medicaid expansion is unlikely to have the positive economic impact that the expansion’s supporters predict. On paper, Medicaid appears to provide attractive coverage, but the program often delivers substandard health outcomes and access to medical services. Studies have found that Medicaid patients have worse surgical results and more late-stage breast cancer and melanoma diagnoses than the uninsured. A 2008-2009 survey of metropolitan Detroit medical specialists found Medicaid patients were not accepted by 33 percent of dermatologists, 41 percent of family practitioners, 50 percent of obstetrics-gynecology specialists and 67 percent of orthopedic surgeons. Presented with federal Medicaid-expansion subsidies, state policymakers may find it easy to underestimate both Medicaid’s drawbacks and the availability of viable alternatives. Medicaid’s problems, its current burden on state taxpayers and the high and unpredictable costs of a Medicaid expansion under the Affordable Care Act suggest policymakers should be wary of widening the program’s scope.